My time in Oaxaca is coming to its close. I successfully completed my weaving called “It Rains Almost Everyday”. In that piece I incorporated a pattern that Norma taught me called the ‘eye of rain’. I also finished my other landscape backstrap weaving, and will be finishing my frame loom piece today or tomorrow morning. I’ve been doing sketches and small-scale drawings of places I have visited too. I hope to create large drawings and watercolors for my show at 621 in the spring. I have found that when I draw a place that I’ve been, it allows me to re-experience the visit. It also allows for small detail that I might have missed initially to come into focus. I have been taking a lot of photographs to document our adventures and now they are becoming quite useful. I am so thankful for my time here, but I am looking forward to heading home on Monday! Week three is slowly coming to an end. This week, we completed our lessons with Norma and I was able to warp both looms for new weavings. My fourth week in Oaxaca is self-directed, which means I choose how I spend my time. 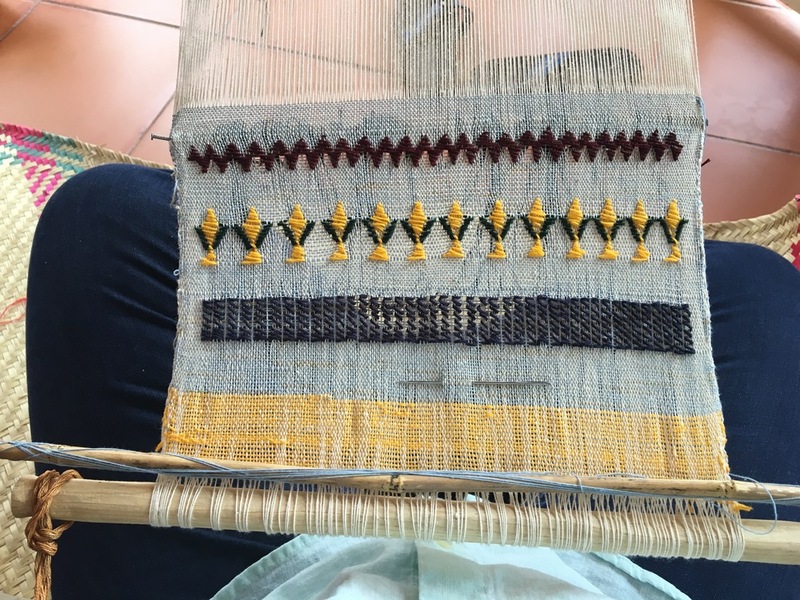 I am hoping to complete the two new backstrap weavings that I started this week, as well as completing a frame loom piece about Hierve del Agua. I will be writing about my experience and hopefully generating ideas for artwork that I can make when I go home. I am also finishing a book or two this week. I have been reading A Field Guide to Getting Lost and 100 Years of Solitude, as well as the readings provided by the residency program. Time will be necessary for me to really synthesize and process all that I have experienced here. But I know I am grateful for my time spent in Oaxaca. Stay tuned for finished weavings!! My second week in Oaxaca went by quickly. I was able to start my experimenting with backstrap and have since completed one piece! In addition to that, Norma taught me more figures on my other loom. I am loving this new technique and how involved the weaver’s body must be. The second week concluded with a series of adventures. We went to Teotitlan de Valle on Friday, which is a community where a lot of weaving and wool rugs originate. If you know me at all, this was a field day for me. I purchased hand-spun and dyed wool yarn from a local woman. Yay! Saturday we decided to take a tour to see a few different sites. Our first stop was the Tule tree. This tree is approximately 2000 years old and is 58 meters wide and 47 meters tall. This tree is HUGE. It was amazing. I took so many photographs of the details and different forms on the tree. We then went back to Teotitlan de Valle and we went to a presentation of the process of carding, spinning and dying wool. They let me try carding the wool and it was much more difficult that I imagined it to be. This made me want an alpaca farm very badly. After that stop, we went to one of the most magical places on the face of the earth. Hierve del Agua. This is a place with mineralized waterfalls, one of 3 in the entire world. This is one of those places that you are standing there and thinking is this even real? Some of my photos look like another dimension or planet. The water bubbles up from springs and reacts with minerals to form cavernous patterns and of course the large cascades. Definitely one of my favorite places on earth. We then went to Mitla, which is an archeological site with a Zapotec palace and other buildings. Our guide was explaining the process of the intricate patterning on the buildings and how there is no glue or cement holding anything together. They calculated and filled spaces with dirt so that when an earthquake came, everything remained intact. The patterns are all so beautiful. Going into this week, I will be working on new weavings. I am starting to investigate rain and prayers for rain. Rain keeps popping up, so I’m digging into it. Norma mentioned that the wedding huipil (a very nice blouse) that girls wear features the God of rain. And I also read in a book that some people use weaving as a prayer for rain. I then started to investigate the biblical meanings of rain and asking for rain from God. Rain could mean growth for crops, fertility, cleansing, etc. so many things. So if you have any tidbits about rain, shoot me an email! Start of week 2 in Oaxaca! 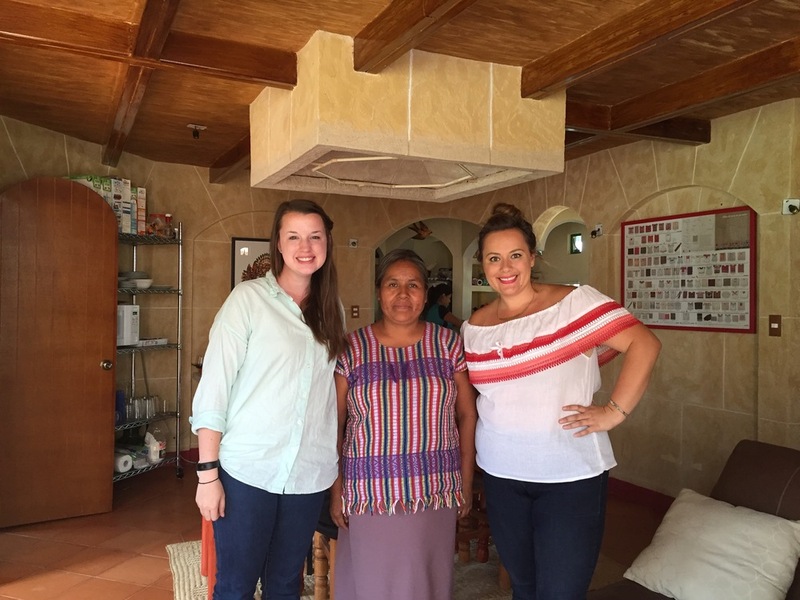 The last few days in Oaxaca included our first weekend and then 2 class days with Norma. I was sick over most of the weekend, so I didn’t get to do much. Sunday we went into town and we saw some of the most beautiful Mexican dancers and I was lucky enough to take a photo with them. (its on my instagram). Yesterday and today we had instruction time. I learned more patterning and today started setting up my second loom. Tomorrow I will be able to start my own experimentation with the medium. I am very excited to incorporate some of the fibers I have purchased and other items I have collected. We usually go on walks in the evenings around San Pablo, so I wanted to share some of those photos with you! Follow me on instagram @gaelin_craighead for more photos! Thursday morning came quickly, marking our third day of instruction with Norma. We learned more design work with thread and I was able to show her a frame loom and how to use one. I gave her a small one of her own and she seemed pleased. I was able to ask her questions about setting up dimensions for future weavings and next week we will be exploring the possibilities further. Class was followed by a trip into town where we shopped and ate lunch. I bought a beautiful wool wall hanging and had delicious fried fish for lunch. We were all quite tired after lunch, so we rode a taxi back to the house. Thursday night there was supposed to be a meteor shower that was visible for the southern hemisphere, so I set my alarm for a 2AM wake up call. I woke to find flashes of light in the mountains; it was almost like a rhythmic lightning with absolutely no sound. It was pretty cloudy, so I assume the clouds blocked the meteors and all I could see was the light coming off of them. Nonetheless, it was pretty amazing to watch. Friday morning we were taken into town to buy materials for our workshops. After trying a couple stores with no luck, I arrived to the Museo Textil de Oaxaca. This museum had a gorgeous collection of textiles as well as a store. In the store I was able to purchase a couple skeins of dyed wool yarn as well as something I had never seen before- It is called Ixtle, and it is a fiber that is taken from the inside of the leaves in an agave plant. It’s white and smooth, and has a resemblance to horsehair. I am excited to integrate this new fiber into weavings next week. I also hope to journey to a weaving community called Teotitlan to purchase more wool yarn for my pieces. We rode home after our few hours of shopping, and I was able to take a nap and sketch ideas of projects to come. Monday morning at 4:30am, I boarded my first flight on my journey to Oaxaca. After connecting in Miami and landing in Mexico City I had 2 hours before my next flight. I aimlessly made my way through customs and immigration and got lost a few times while trying to find my gate. Thankfully, I found Gate 3 and waited for boarding. To my surprise, I had a seat with the extra leg room that I am usually envious of, and on to top of that the seat next to me was empty. In a quick 40 minutes, we landed in Oaxaca. My next task was getting a taxi to the pickup spot for my residency- the Oaxacan Coffee Company in downtown Oaxaca City. A collectivo dropped me off at the café, and I went inside to enjoy a nutella croissant and an extremely strong cup of coffee. A few hours later, myself and the other artists were picked up and taken to the residency home in San Pablo de Etla outside the city. The home holds 4 artists at a time, and I am lucky to have 3 lovely ladies to spend the month with. The residency building has breathtaking views of the mountains on one side and the city on the other. By the end of Monday, I was utterly exhausted and retired to my bed and mosquito net for a long night’s sleep. Night has a distinct soundtrack here. Sleep is accompanied noise of dogs, donkeys, roosters without effective internal clocks, and the neighbor’s music. But sometimes, it’s just joined with the sound of rain on the windows and roof- which is a much better sound. On Tuesday, I had my first lesson with my instructor. Her name is Norma, and she has been weaving almost twice as long as I have been alive. She doesn’t speak English, and I don’t speak Spanish, but words aren’t required often for this exchange of information. I do have another artist in the workshop with me, who speaks beautiful Spanish and is happy to help me when necessary. In our first session, we strung counted our first set of warp threads and placed them onto the backstrap loom. This type of weaving requires your entire body. The loom is attached to a wall or post, and there is a strap that is placed around your back to create the tension of the warp. Before you begin, you have to separate each thread on the wooden rods so that is all evenly spread apart. Norma then had me make what is basically a heddle bar, using only string. We use a wooden machete separate the warp threads and wooden sticks and rods for thread bobbins and width regulation. This process is much slower than the weaving I am used to. The fibers are much more fine, and my back gets tired from holding the loom. We told Norma that she must be very strong from doing this. It feels like a workout. Although the process is slow, it is paying off immediately. The small amount that I wove Tuesday made me so proud. She taught me how to add columns with string and then we started a corn husk design before class was over. Learning this technique makes me so impressed with the women that can do this all day and at a rate much quicker than mine. Each string is cared for, counted and moved- and each row is pushed down with the machete. Norma keeps telling me ‘fuerte’ ‘fuerte’- I don’t seem to be using enough force. Like I said earlier, this is going to make me strong. I recently completed my MFA Thesis work and images are now on the website! The work is called Altarpiece. Images can be found under the "Work" tab! Thanks to these 33 people who donated to my Kickstarter. I am fully funded and will start making the rewards for everyone!! Velma Hines, Dan Stewart, Elise Thompson, Mary Grace Allison, Haley McKeehan, Susan Williams, Anna Broussard, Elaine Diaz, Andrea Jones, Molly Gleason, Chris Craighead, Marisa Estes, Marybeth Tawfik, Joanna Waldron, Carolyn Henne, Ashley Schermerhorn, Michael Horlikck and Liz Saint Rain, Melissa Robinson, Margaret Hester, Greg Cox, Beverly Craighead, Rita Jackson, Danielle Thomas, Chris Craighead Sr, Sharon Norwood, Helaine Braunig, Erin Mello, Michelle Eccles, Holly Hanessian, Brian Curran, Pam Massery, Lis Blair, and Nelda Graza. And those of you that sent funds in: Marla Riedel, Jennifer Infinger, Laverne Lee, Lance and Tiffany Beauchamp and Megyn Tiller!! All of these people are so generous to have helped me reach my goal. I am going to Mexico!!! Louisiana native and Tallahassee based textile artist, Gaelin Craighead has been chosen to participate in an international artist residency program in Oaxaca, Mexico during the summer of 2016. This month long residency includes private studio space for one month as well as instruction from a master weaver for three weeks. Gaelin hopes to not only master the techniques of back strap weaving, but also to create a series of weavings that document her time in Oaxaca. She will be immersing herself in the culture and tradition of her craft. Weaving is an art form that is rooted in tradition and community, and Gaelin is looking forward to studying her craft in such a traditional setting. Gaelin plans on sourcing her materials from Oaxaca for her weavings and to get to know the local craftspersons as much as possible. After her return to the U.S., Craighead will seek out an exhibition space to display the work created during her time in Oaxaca. Penland School of Crafts is an international center for craft education located in the Blue Ridge Mountains. I received a scholarship that enabled me to attend a 2 week workshop entitled "Contemplative Cloth". As I am going into my third and final year of MFA study, I wanted to use this time to increase my knowledge base of methods of textile art-making as well as indulging in the opportunity of being away from the world and focusing solely on studio time for 2 weeks. Under the instruction of Jason Pollen, our class worked with mono-printing, dying silks, experimenting with acrylics on different fabric, as well as hand and machine stitching. The processes I learned will benefit me as I moved towards my thesis. I am grateful for the artistic experience as well as all the connections with other artists I was able to make.